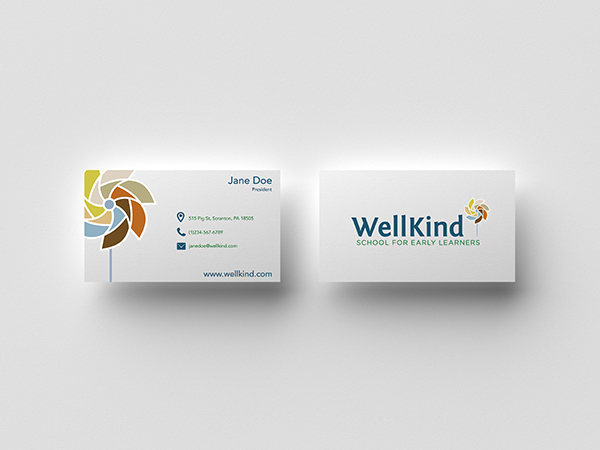 When the Wellkind School for Early Learners approached us about a rebranding of the 5-year old childcare and early learning center, they had a well-defined vision to guide the process and ensure that the finished product felt true to their mission. Previously operating as Freckles and Frills, the Wellkind School for Early Learners is located in the South Side of Scranton on Fig Street. With a newly-developed seven-pillar philosophy guiding its curriculum, the school sought to shed its playful representation for one that adequately expressed its new educational approach. Brain Building: Stimulating cognitive growth through exposure to new challenges which allow for problem solving strategies and critical thinking skills to emerge. Healthy Lifestyle: Promoting of healthy habits, leading an active lifestyle, activities to enhance muscular strength and coordination, and balanced nutrition. Emotional Growth: Actively working towards emotional intelligence, managing stressors, distinguishing and expressing feelings in a constructive way, and practicing a positive approach to life while facing obstacles with a curiosity to problem solve. Relationships: Creating conditions in which healthy relationships form and are maintained through talking, sharing in new experiences, and participation in events. Purpose & Passion: The personal and professional development of new skills and interests as well as seeking out opportunities to grow and learn through meaningful experiences. Environmental Impact: Awareness of our role in the community to protect our resources and advocating for keeping our world a clean, safe, and sustainable place to live. Gratitude & Appreciation: Seeking out all of the goodness around us, appreciating the beauty in life, and cultivating a culture where we work together towards this common goal of choosing to see through a lens of gratitude and appreciation. In addition to the logo design and stationary suite, BlackOut developed a new website design that will serve parents, faculty and staff that is anticipated to launch in Q1 of 2019. We’re so grateful for the opportunity to support a local client with such an admirable mission and we look forward to seeing how the school will grow and evolve to meet the needs of the community.